If you’ve been struggling with mysterious symptoms and having a hard time pinpointing the root cause of seemingly unrelated health issues, you should consider biotoxins. Biotoxins can come from insect bites, mold growing in your home, and many other sources. I’ve noticed an increasing number of biotoxin-related illnesses in my practice, especially in younger individuals and I believe this rise is happening across the country. You see, biotoxins cause widespread chronic inflammation, which in turn causes symptoms throughout the body’s systems. This can cause nonspecific symptoms such as brain fog, fatigue, general malaise, vertigo, and headaches. Symptoms such as these can be confusing, even for your doctor, which is how biotoxin illness has largely gone mis– and underdiagnosed. One biotoxin illness, chronic inflammatory response syndrome (CIRS), up until recently wasn’t taken very seriously (unfortunately, it still isn’t taken seriously by some medical professionals). As a result, many patients end up defeatedly going from doctor’s office to doctor’s office, at a loss for what’s happening to their body. We now know CIRS is a very real condition, and it is caused by biotoxins. CIRS is considered a subtype of biotoxin illness. So how do you know if you’ve been exposed to a biotoxin? What are some of the signs, and what can you do? Let’s take closer look at what biotoxins are and how they affect your health. Biotoxins are a group of substances that are toxic to humans and biological in nature. They can be made by plants, bacteria, fungi or animals. Biotoxins are usually a defense mechanism for the creator, though not always. Biotoxins have a wide range of negative effects on the human body, targeting different systems – such as neurotoxins, which impact the nervous system and cytotoxins, which impact individual cells. Mycotoxins and Lyme biotoxins are both proving to be a silent crisis and the medical community is only just now realizing how bad they are. Why are these biotoxin-related illnesses on the rise? Both mold related illnesses and Lyme disease are on the rise in America. With mold, it’s mostly due to the fact that we now build our houses out of paper and wood, which when combined with moisture is a perfect breeding ground for mold. An estimated 50 percent of American homes now contain toxic mold and an estimated 80 percent of all CIRS cases are caused by water damaged homes. And when it comes to Lyme disease, it’s thought that the rise is due to many factors. One of which is climate change and the elimination of predators of carriers (mostly rodents), due to deforestation and habitat damage. Lyme disease is most prevalent in New England, and I’ve personally seen a significant increase in my own patients who hardly leave urban area of New York City. Once you are exposed to a biotoxin, the immune system flags the invader and works to have it broken down and removed. If someone is exposed repeatedly or in sufficient levels (living in a moldy home, for example), the biotoxin can’t fully be removed and sets off a series of inflammatory responses throughout the body. It’s much like digging a hole in sand. If the there’s too much, can be impossible to get very far as sand continuously fills the hole while you’re digging. With your body, if you don’t remove the assaulting toxin it wears your immune systems down. Then there are some individuals who have genetic predisposition to CIRS that is HLA gene determined. These individuals are much more sensitive to this whole process because their immune system doesn’t properly ‘flag’ the invading biotoxin or have harder time to remove them from the body. In this case, the biotoxins are free to wreak havoc throughout the body because they are never fully removed. This sets off a cascade of inflammatory events. Firstly, through binding to receptors throughout the body. Then, the body begins to recognize the biotoxin, which causes a cyclical upregulation of numerous inflammation causing pathways. Essentially, biotoxins cause a vicious cycle of inflammation that requires intervention, especially if you have the HLA-DR gene. An estimated 25 percent of the population has this genetic mutation, which makes it difficult for your body to rid itself of toxins. How do you know if you’ve been exposed to biotoxins? When you’ve been exposed to a biotoxin, your symptoms could be acute or chronic depending on the biotoxin, potency, length of exposure, your genetic status, and more. One thing is certain though – you want to address it earlier rather than later. The longer you go untreated (especially if you’re still being exposed to the toxin), the more complex your symptoms, diagnosis, and treatment will become. If you suspect you’ve been exposed to biotoxins you can request an appointment here. If you’re not in the New York area, I recommend finding a functional medicine doctor who has experience in biotoxin illnesses. It’s quite possible we are only beginning to fully realize how harmful biotoxins are. Only recently a subset of Alzheimer’s disease was identified as being caused by mycotoxins. The Visual Contrast Sensitivity (VCS) test checks your ability to differentiate details, which is an indicator of neuroinflammation. A major cause of neuroinflammation is exposure to biotoxins – Mold and Lyme are some of the most common. There are other causes of neuroinflammation besides biotoxins, this is just one common cause. The VCS test is a good place to start if you think you’ve been exposed to biotoxins because you can do it at home, it only takes 10 minutes, and it’s only $10. If you test positive for neuroinflammation, you should request an appointment immediately. In 2015, over 95 percent of all new Lyme disease cases occurred in only 14 states – New York was one of those states. When you’ve been exposed to biotoxins, it’s important to seek out a doctor experienced in these illnesses because they are confusing and frequently misdiagnosed. I regularly have patients who come see me that have been searching for the cause of their mysterious illness for years. 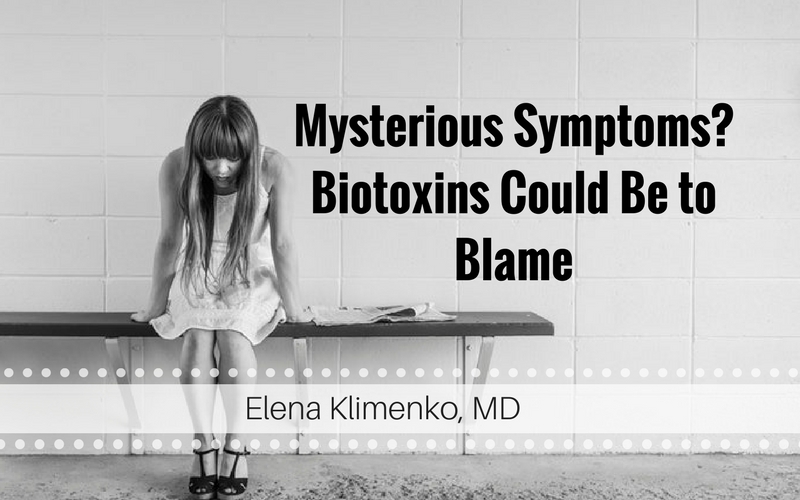 If you have been struggling with mysterious symptoms, I urge you to check for biotoxin exposure.